Nearly $4 billion in refunds were delayed by the 2013 shutdown under Obama. A top Democrat believes the Trump administration's instruction to the IRS that it process tax returns and issue refunds on schedule -- whether the government is fully funded or not -- is illegal. "There are $140 billion, approximately, in tax refunds that won't be able to be sent," House Majority Leader Steny Hoyer, D-Maryland told reporters Tuesday. "The president now is going to order them to do what we think is illegal to do because he wants to act like a dictator. Federal employees are being deeply damaged by this continuing long-term shutdown." Hoyer said House Democrats will be bringing several appropriations bills to a vote this week and the next, including one on Wednesday that would fund the Treasury Department and IRS, pressing Republicans to end the shutdown without funding President Donald Trump's border wall. The White House ordered the tax refund plan Monday, which was later confirmed by the IRS in a statement. “We are committed to ensuring that taxpayers receive their refunds notwithstanding the government shutdown," IRS Commissioner Chuck Rettig said in the statement. This stands in contrast with the 2013 government shutdown over funding Obamacare, during which "roughly $3.7 billion in refunds (including $2.2 billion in refunds to individuals and $1.5 billion in refunds to businesses) were delayed," according to a 2013 report from the Office of Management and Budget. 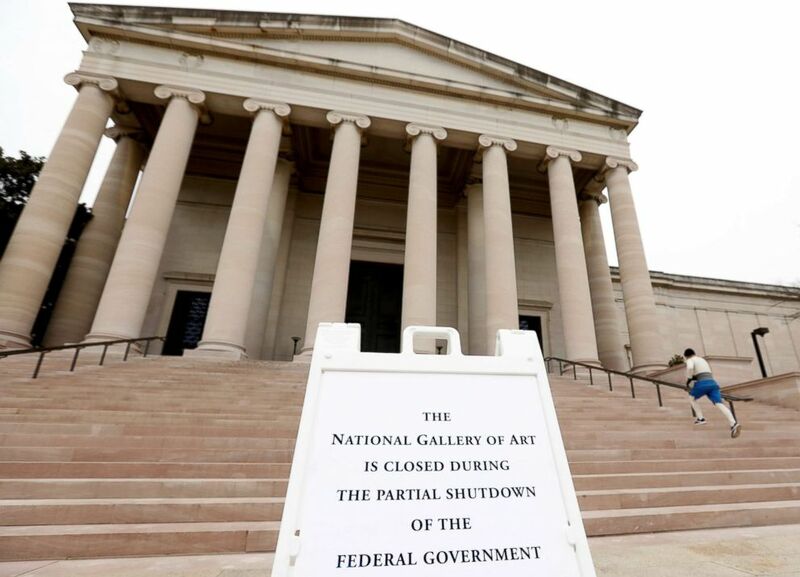 (Kevin Lamarque/Reuters) The National Gallery of Art, which is closed due to the partial government shutdown, in Washington, Jan. 4, 2019. While about 87.5 percent of the IRS workforce has been sent home, the agency said it will be recalling "a significant portion" of its nearly 70,000 furloughed employees to handle the workload. It is not yet clear how many people will be brought back or when they can expect to be paid. Details on how filing season will be handled are to be released "in the coming days," according to the IRS. Two lawsuits have already been filed against the U.S. government by federal workers union groups on behalf of employees who have been required to work without pay, raising the possibility that the White House's move to recall IRS workers to process tax refunds will be challenged in court. Russ Vought, acting director of the Office of Management and Budget, told reporters Monday that the plan to boost support for taxpayers is part of a broader administration goal to lessen the burden on ordinary people. In addition to timely refunds, national parks will have their bathrooms cleaned and trash removed, for example. “Our mission from the president is to make this shutdown as painless as possible, consistent with the law,” Vought said. But as the battle over funding the government passes its 18th day on Tuesday, some Democrats will likely see the attempt to shield citizens from the pain of the shutdown as a political ploy by the administration, even if not an illegal one as Hoyer believes. If more Americans are hurt by the partial shutdown, by receiving late tax refunds or encountering trash piles at parks, more public pressure could build for the president to fold by signing legislation that funds the government, but not his desired border wall. Trump could be releasing some of that pressure with Monday's decision. Though refunds were delayed as a result of the 2013 shutdown under Obama, the idea of the IRS funding them during a shutdown is not wholly unprecedented. In 2011 the IRS was prepared to process some refund requests electronically in the event of a shutdown, according to the agency's contingency plan published that year. "Consequently, the IRS contingency plans provide that it will continue to process e-filed returns, both those with payments and those claiming refunds, to avoid disrupting automated systems," a 2011 IRS report to Congress stated. But that same year, the OMB directed the IRS not to pay refunds during a lapse, citing the Antideficiency Act, which prohibits federal agencies from spending federal funds during a shutdown "except for emergencies involving the safety of human life or the protection of property." The IRS addressed this disagreement in Monday's statement, saying the OMB has revised its position on refunds. "Although in 2011 the Office of Management and Budget (OMB) directed the IRS not to pay refunds during a lapse, OMB has reviewed the relevant law at Treasury’s request and concluded that IRS may pay tax refunds during a lapse." President Trump is scheduled to give an address on border wall funding from the Oval Office Tuesday evening. ABC News' John Parkinson and Jordyn Phelps contributed to this report.